Indian reality, it appears, owes its concrete foundations to private equity. Investment capital from uber rich individuals and institutions ­ or private equity (PE) financing in the broadest sense of the term ­ now makes up 75% of the funds propping up India's property market, compared with just about a fourth in 2010. Total funding in the real-estate sector increased 40% to $5.4 billion in 2016 from $3.8 billion in 2011. This includes fund flows from PEs, non-banking financial companies, banks, and the capital markets, said a Knight Frank India report. Banks used to account for anywhere between 50%-57% of the sector's institutional funding requirement until 2014. In the past two years, bank credit to the sector has slumped to about 26%. “As the real estate market in India matures, driven by both regulatory and market forces, we expect PE capital to play an even greater role. Creation of public markets for commercial assets in the form of REITs (Real Estate Investment Trusts) and sale of distressed assets by banks to reduce non-performing assets are some of the drivers that would attract a lot of foreign capital into India's property market,“ said Rajeev Bairathi, ED & head of capital markets, Knight Frank India. 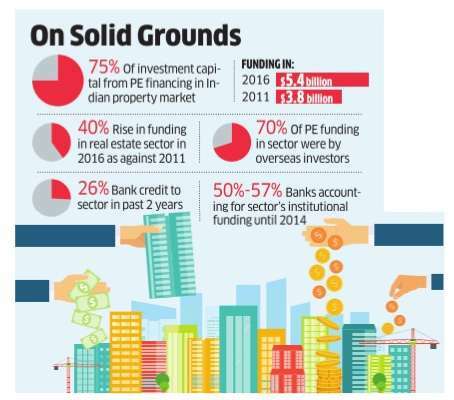 Overseas investors accounted for more than 70% of the total private equity funding in the Indian real-estate sector during 2016, and the trend will likely continue. These investors have largely favored debt or structured debt funding since 2012, with such products making up more than a third of such transactions. Howe ver, experts believe, that it is time for a change. “PE players will have to revisit the drawing board to devise the nature of their participation in real estate. Gone are the days of evaluating security values based on projected capital rates and cash flows to take secured debt positions,“ said Rubi Arya, fund raisingVC, Milestone Capital Advisors. Arya says PEs have to now move toward greater equity ownership. “The returns on these debt positions are diminishing and this challenge will become bigger as developers shy away from high-cost debt. PE funds will have to increase their risk appetite as pure debt opportunities will not be available with well-established brands. Taking quasi-equity positions or pure equity position is the way forward for achieving higher returns,“ she said. According to her, the structured debt will continue to be a preferred option for smaller developers, while large developers will attract quasi-equity funding. Within equity funding, project level investment continues to be the preferred model, with only 1% of total private equity investments witnessed at the entity level during 2016. This is significantly lower than 16% and 30% share of entity-level investments in 2014 and 2015, respectively. “The current environment for real estate is both challenging and opportunistic at the same time. Bank credit to real estate sector has witnessed a sharp reduction in the last two years. Rising non-performing assets, higher provisioning, and mounting losses in the real estate sector have led to significant reduction in credit offers by banks,“ said Samantak Das, chief economist and national director, research, at Knight Frank India. The initial public offering (IPO) route, which was one of the preferred fundraisings in 2010, has vanished in recent years due to the poor capital-markets credibility of the companies operating in this sector.